On Thursday, Americans will take off of work, sit around with family, and eat turkey to celebrate the Thanksgiving holiday. But there’s something way more important happening in Austria: OPEC is meeting. And with crashing oil prices threatening the budgets of the oil-producing nations, this will be one of the most important OPEC meeting in years. OPEC, or the Organisation of the Petroleum Exporting Countries, is an international cartel comprised of 12 members that coordinate oil prices among its members. OPEC’s members include, Saudi Arabia, Iran, Iraq, Kuwait, Venezuela, Qatar, Libya, the UAE, Algeria, Nigeria, Ecuador, and Angola. 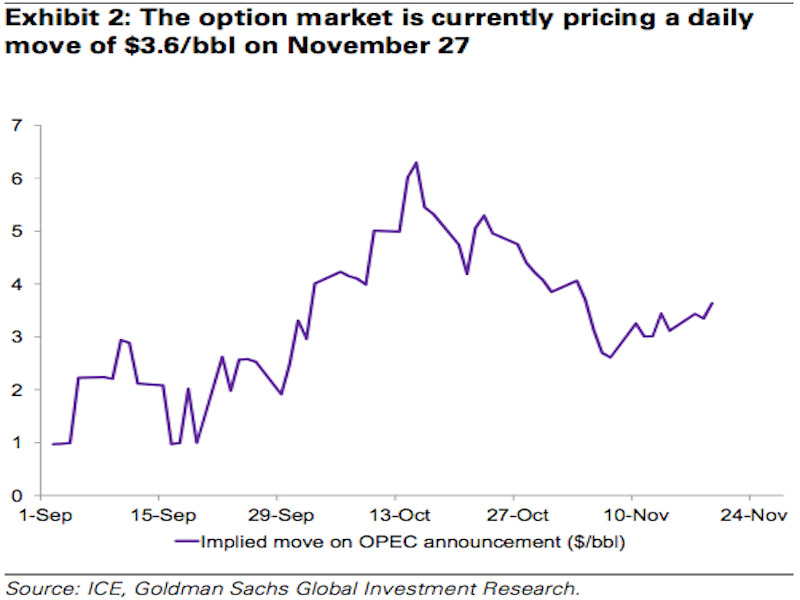 At its Thursday meeting, OPEC is expected to announce a “modest reduction” to its current production rate, according to a note from Goldman Sachs analyst Damien Courvalin. Over the last several months, the price of Brent crude oil, which is typically cited as the global benchmark, has fallen more than 30% from more than $US105 a barrel in early summer to less than $US80 of late. West Texas Intermediate crude prices have also fallen nearly 30% over that period. In his note, Courvalin writes that OPEC can likely only begin to balance global supply through a modest production cut at first, as OPEC needs low prices to be sustained to allow for US production to slow. 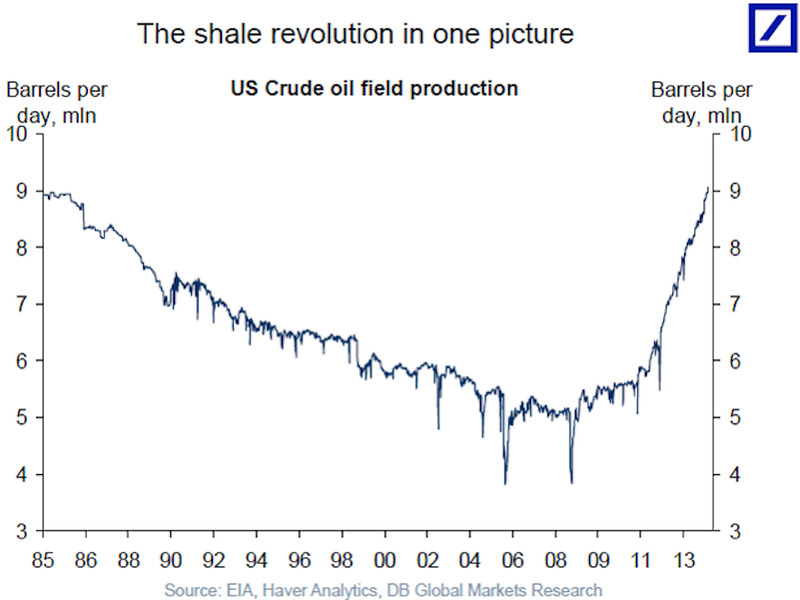 Deutsche BankUS oil production has been exploding in the last couple of years, increasing global supply and weighing on prices. 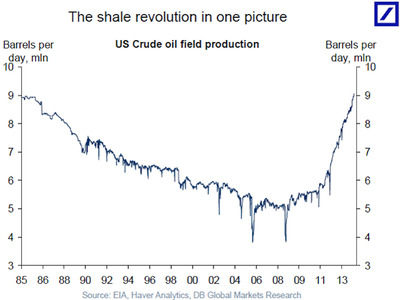 “[A]ny large [production cut by OPEC on Thursday] that would lead to a large price rally would be self-negating as it would enable US producers to hedge 2015 production and sustain elevated production growth,” Courvalin writes. Courvalin notes that communications from Libya, Iraq, and Iran have indicated that these countries will not be reducing output, while OPEC’s broader communications indicate the potential for only a modest production cut. 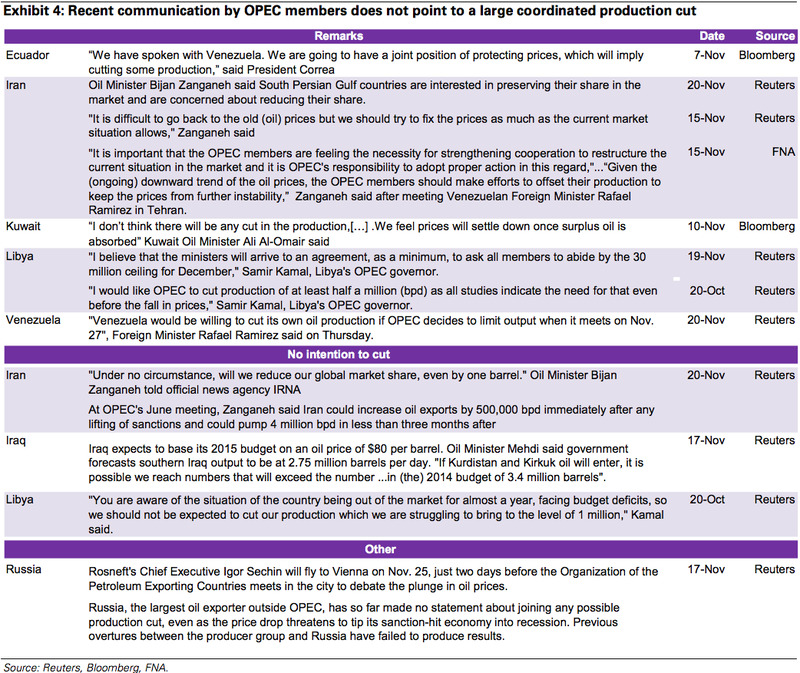 But with this split, Courvalin notes that the odds of coordinated action from OPEC have been lowered, adding that past actions for reduced production have only been loosely implemented. report from Reuters early Monday said that some oil market players see a downside risk for prices if OPEC cannot come to an agreement on a production cut. “The market would question the credibility of OPEC and its influence on global oil markets if there was no cut,” said Daniel Bathe, of Lupus alpha Commodity Invest Fund. That could send Brent down to around $US60, Bathe said. 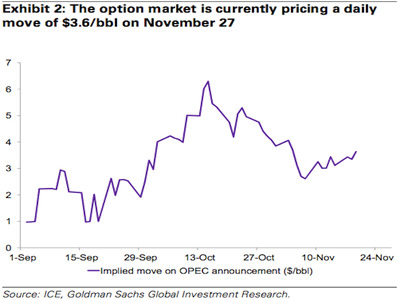 Goldman SachsThe options market expects Thursday to be a volatile day for oil. “Herding behaviour and a shift to net negative speculative positions should accelerate the price plunge,” he added. And a report from Bloomberg on Monday, citing comments from former Qatari oil minister Abdullah Bin Hamad Al Attiyah, said that Russia, Mexico, and Norway, who are not OPEC members but are major oil exporters with government budgets that rely on oil prices and production, must come to the table and discuss coordinated action to balance supply in the global oil market. 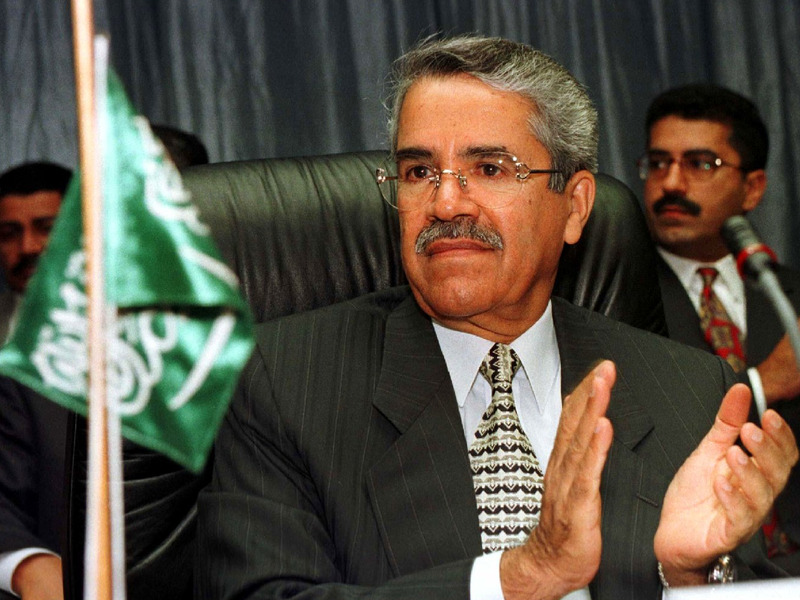 “OPEC had been enjoying easy meetings, and decisions were taken without a sweat. Now the situation is different,” Al Attiyah told Bloomberg. And so while the US markets will be closed Thursday, and only open for a half day on Friday, the rest of the world will still be working, and the biggest market story of the last three months — oil — will not be in a food-induced coma to end the week. 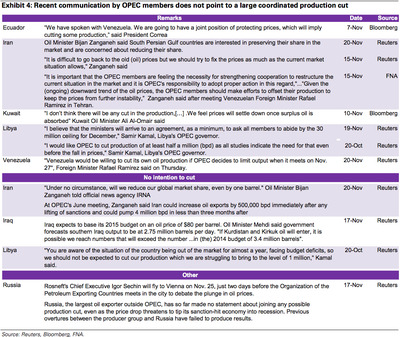 Via Goldman Sachs, here’s a quick primer on everything OPEC members have said about production cuts over the last several weeks.